Think back to a recent day when you had a lot of energy and got a lot done. How did you sleep the night before? Soundly? Now think of a time you were grumpy and every little thing seemed to irritate you. Did you get enough sleep the night before? Probably not. Not getting enough sleep can set your entire day up for failure. You may wake up so tired that you’re tempted to drink loads of coffee just to wake up. But that much caffeine can negatively affect your sleep the next night, too. Let’s dive into what happens during sleep and some ways you can get a good night’s rest so you wake up refreshed and ready to take on the world! 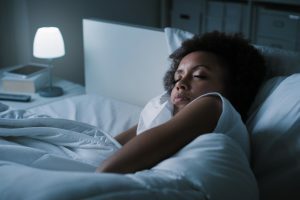 Before we talk about how you can get a few more ZZZs at night, we need to understand why sleep is so important in the first place. It turns out that our bodies do most of the healing and growth we need while we’re sleeping. It may help to use an analogy. Imagine you’re going to a sports game. After the game is over and you and the rest of the fans leave, the staff stays to get the stadium cleaned up and ready for the next day. Now, imagine that the fans won’t leave the stadium, but the staff still needs to clean it. Your body works like the staff, cleaning itself and preparing for the day ahead. Without getting enough sleep, it’s almost like trying to clean up the stadium while all the fans are still there — your body can’t heal itself and get you ready for the next day if it doesn’t have the opportunity to. Not getting enough sleep can also have consequences for your health. When people are sleep deprived, their bodies are searching for either more rest or more energy, so they may tend to eat excessively and eat more unhealthy food. Studies have found a connection between lack of sleep and developing diabetes, heart problems, and even weak immune systems. This means the less sleep you get, the more likely you are to get sick. Aside from physical effects, not getting enough sleep can also make you feel more stressed and increase your chances of developing depression or anxiety. Remember when you had a bedtime growing up? This was about more than just giving your parents a break from you running around the house. It plays a huge role in creating a routine for bedtime. Even as adults, we can use bedtime routines to help us get the 7-8 hours of sleep we need. If you think about what time you have to get up in the morning and work your way backward, that should give you a good idea of when your bedtime should be. Your bedtime routine would ideally start even before that. This might include time for taking a shower, getting out your clothes for the next day, prepping your lunch, brushing your teeth, or taking a little time to read. Caffeine is known for helping people wake up in the morning, but it can also mess with your sleep cycles if you drink it too late in the day. In fact, caffeine can still stimulate people up to 8 hours after they’ve consumed it. That means if you go to bed at 10 p.m., you might not want to drink any coffee after 2 p.m. In addition, recommended caffeine limits are usually no more than three cups a day. Other things that can help you get good sleep are to avoid cigarettes, big meals, and alcohol before bed. Like caffeine, nicotine is a stimulant, so smoking before bed can actually keep you awake. Eating too close to bedtime can keep you awake too, and researchers recommend eating dinner and snacks at least 2 hours before hitting the hay. A lot of people think that alcohol helps you sleep, but drinking actually messes with your sleep cycles while you’re asleep, meaning you’re not getting enough restful sleep. Not drinking before bed will actually help your body get the rest it needs. Some people like to track their sleep patterns using an activity tracker such as a Fitbit. There are also free or inexpensive apps available for download that can even help you measure sleep patterns. You’ve probably heard advice about leaving your cell phone alone before you go to sleep or that you shouldn’t fall asleep with the TV on. It turns out there’s actually a great reason behind that advice. The light produced by your cell phone, TV, and computer, called blue light, all interrupt sleep cycles and make it harder for you to fall and stay asleep. So if you’re having trouble falling asleep, picking up your cell phone or turning on the TV is normally one of the least helpful things you should do. As you’re winding down for the night, try putting your phone on silent or do not disturb. That way, you won’t be distracted by any notifications or texts. Instead, try jotting a few of your thoughts down in a journal, reading that book you never seem to get around to, or even meditating to relax. It may be that these suggestions on how to sleep better are only little tweaks, but when you add them all together, they can have a huge impact on your life. Once you start sleeping better, you won’t believe how much better you’ll feel each and every day!